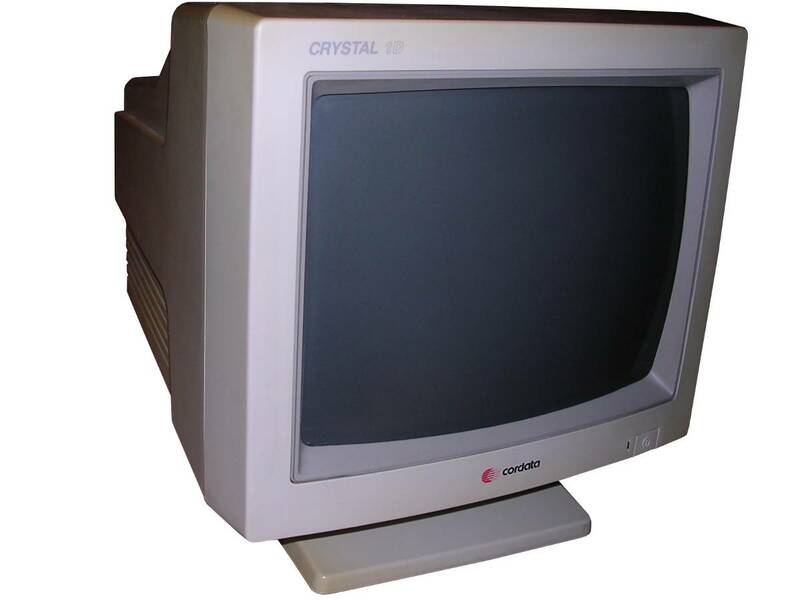 In 1987, VGA board has been released as improvement of EGA (which was not too popular since its debut around 1985), offering a 640x480 resolution in 16 colours. 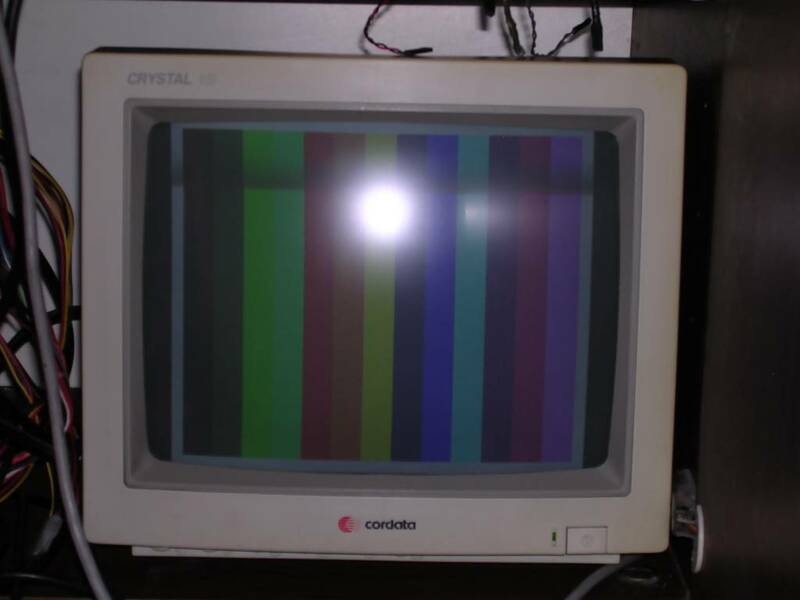 But these were not limited, TTL-type colour lines like in CGA or EGA, VGA displays offered a full-analog RGB lines. 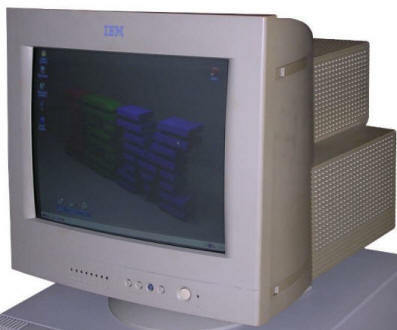 Quickly it was found that with some tricks more colours can be achieved and later the VGA standard has been improved with Super-VGA - first with 800x600 resolution and improved to 1024x768, shifting IBM's 8514 video board from market. 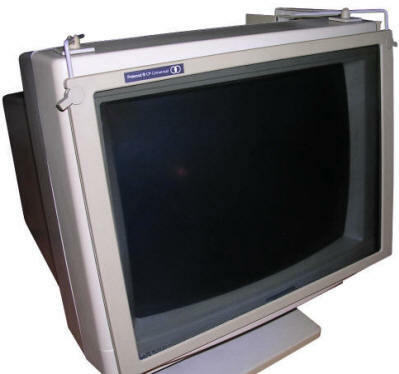 With colour VGA displays, many simplifications had to be removed - the monitor had to support colour on analog lines and only resolution was its limitation. To display a picture in specific resolution, monitor must support signal in certain frequencies - the bigger resolution, the more quickly signals change, and the better monitor's electronics must be. 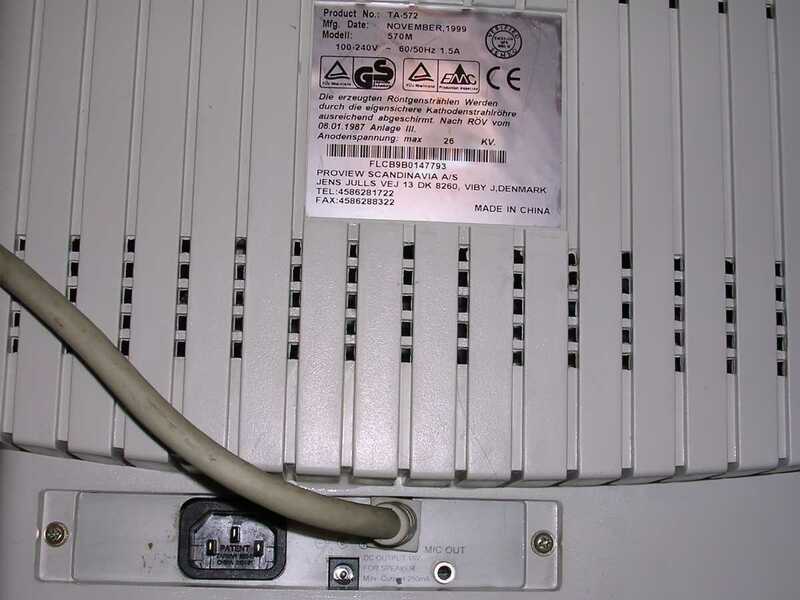 More, if unsupported frequency is used monitor's circuits may be even damaged. That's why you cannot just hook any monitor up to any configuration. 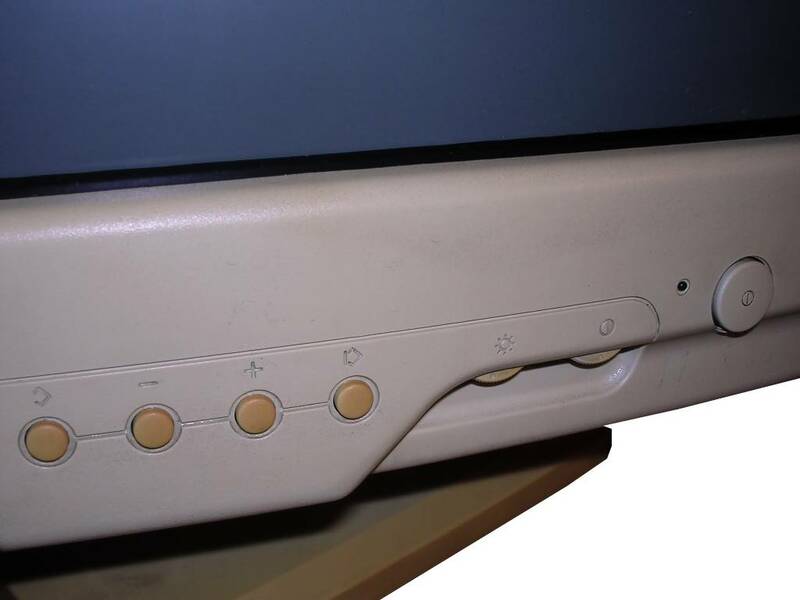 Although in early 1990s Hercules video boards and displays were still distributed, VGA and its successors dominated the market. 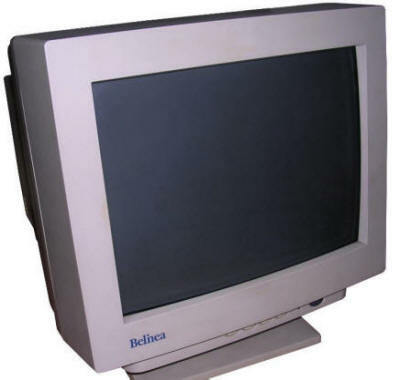 A typical monochrome VGA display for computers of early 1990s. 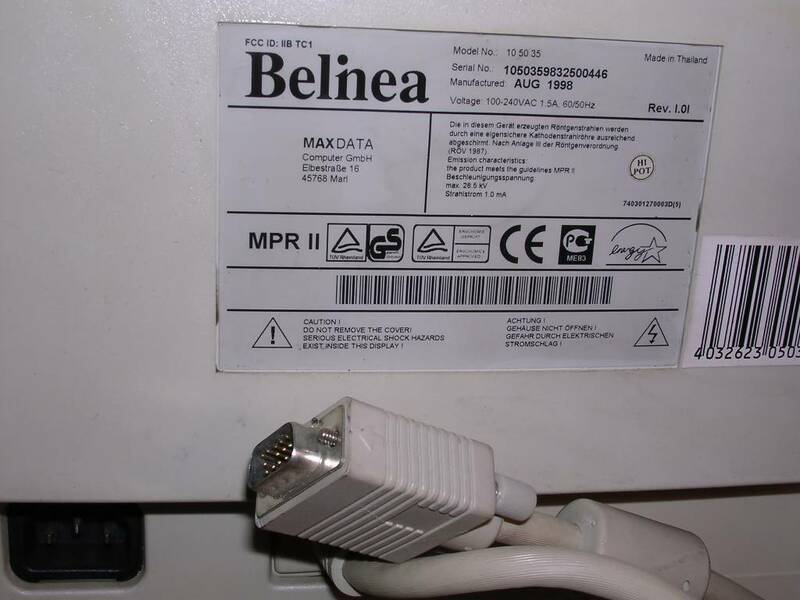 With 15-pin plug and power connector to be plugged to power supply to turn it on with PC. 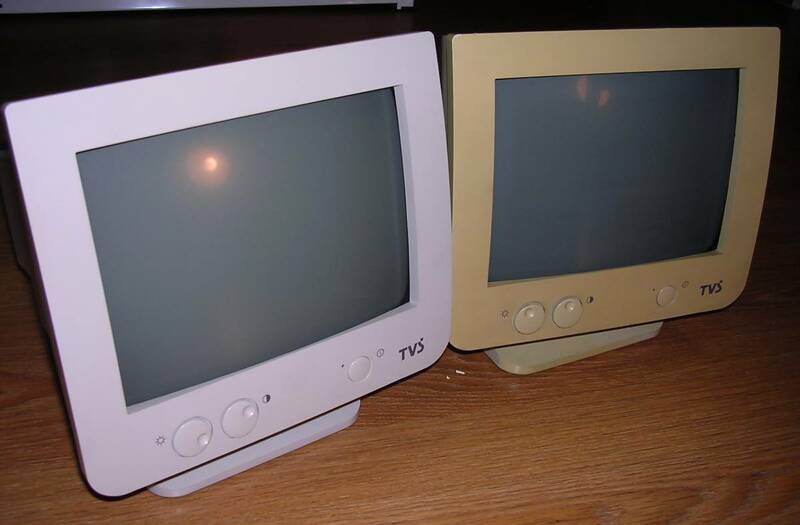 These times in Poland having a VGA was high-end, and displays for VGA were usually monochrome. 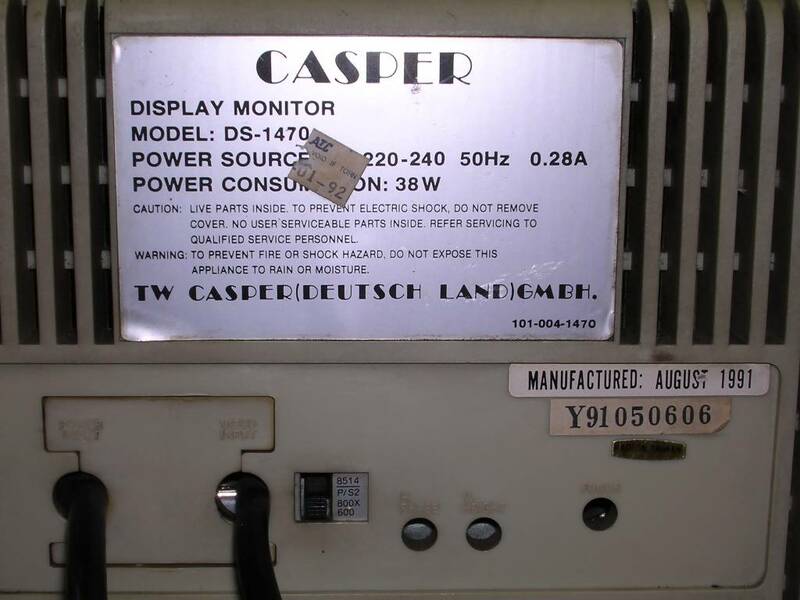 It's a Taiwanese unit, but branded as "Casper" from Germany. Although theoretically it has capability to display 8514, I think that its 1024x768 capability is only for interlaced modes. The contrast dial has power switch built-in. 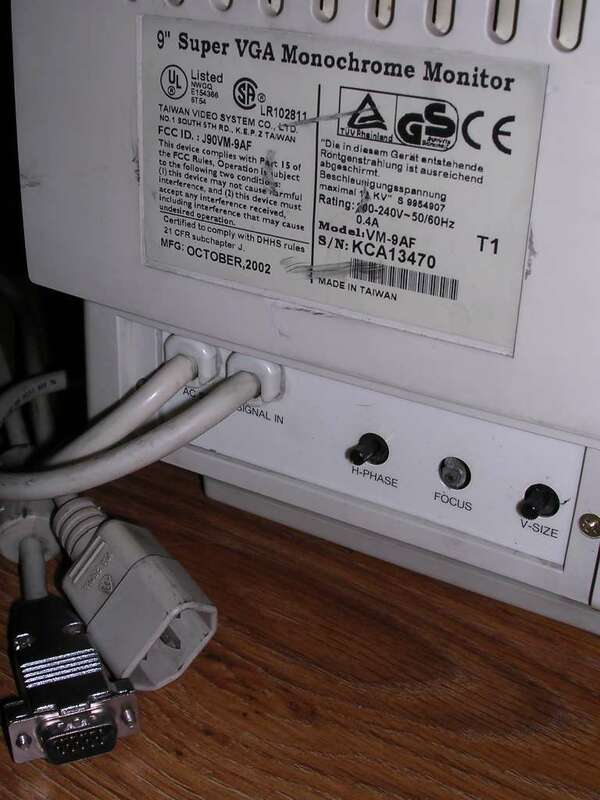 Although it seems not so handy, it was rarely used as the main way to turn this display on was turn the computer on - monitor was connected to power supply unit. 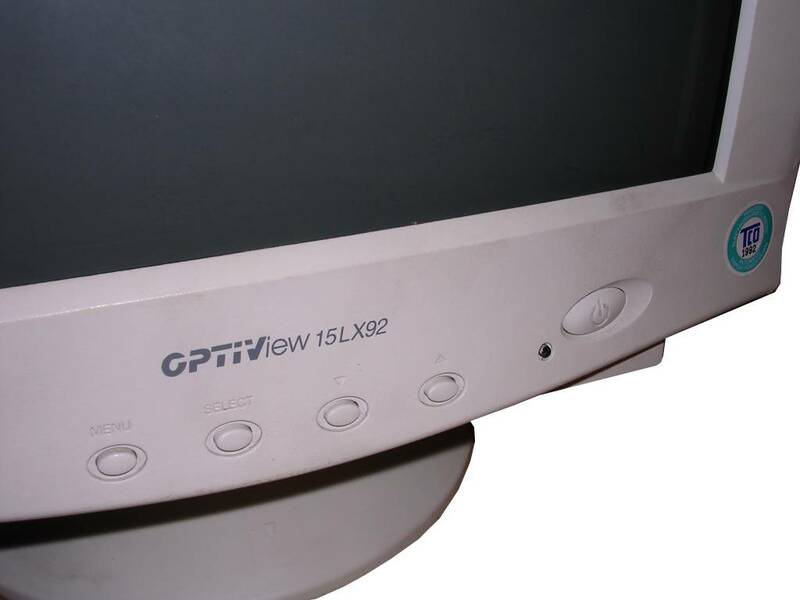 One of the early colour VGA displays from 1990s. It can display 800x600 image, but there its capabilities end. 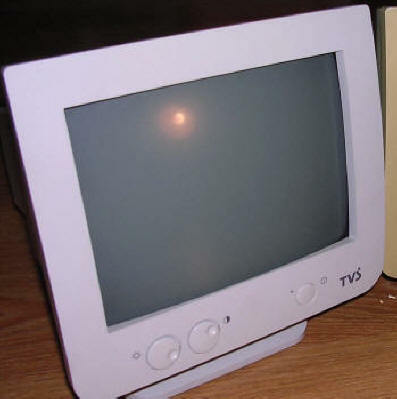 It has a typical set of regulations, bigger than in monochrome displays, but smaller than in more advanced monitors. 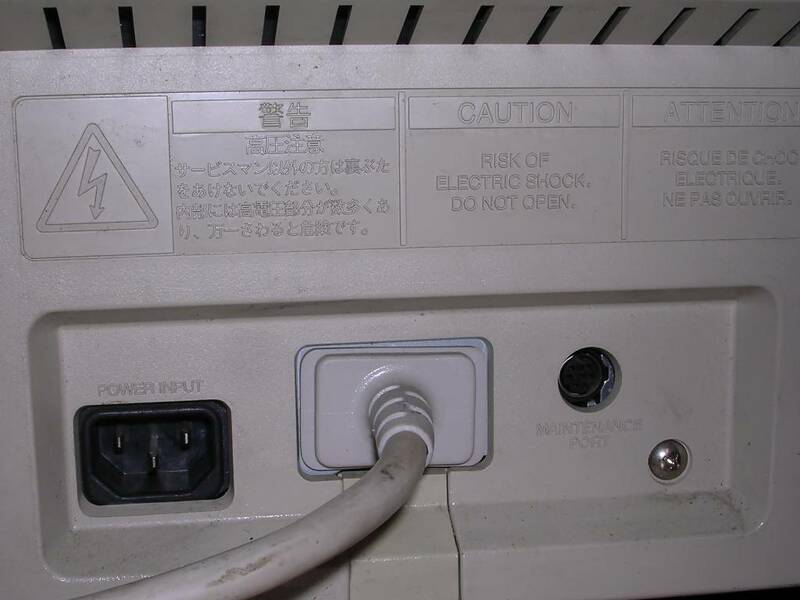 The power switch is located, as usually in such models, in a non-comfortable place as these monitors were usually turned on with PC's power supply. I picked this display unintentionally after typical "I had some 9" colour display, here it is" advert. 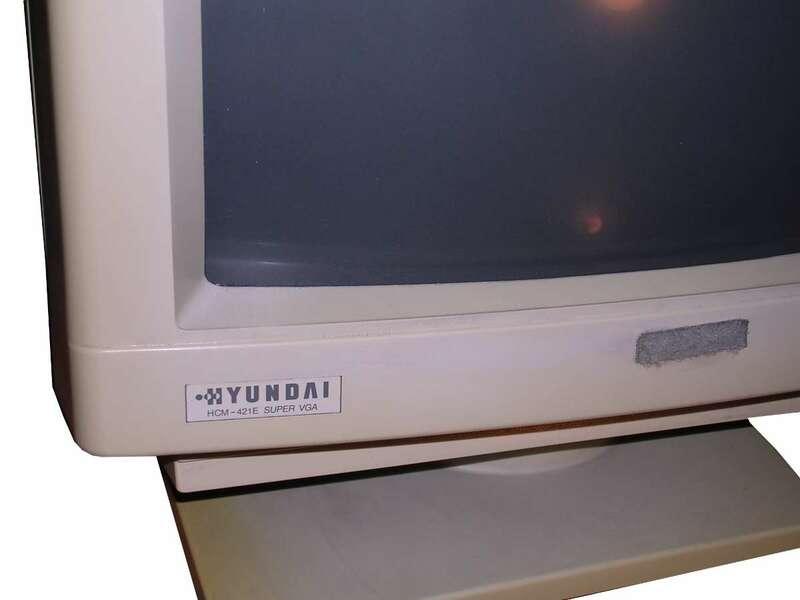 It has typical non-factory "additions" of monitor from this era, it means a polaroid shield (which was believed to protect from some kind of radiation) and a document holder. The shields were popular, some were even grounded, but they usually only made the picture darker, some more expensive ones polarized light. 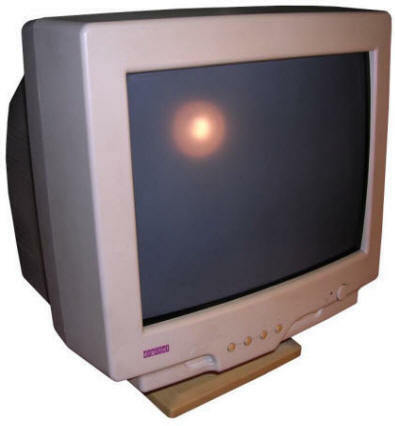 This is a colour Super-VGA monitor of early 1990s. 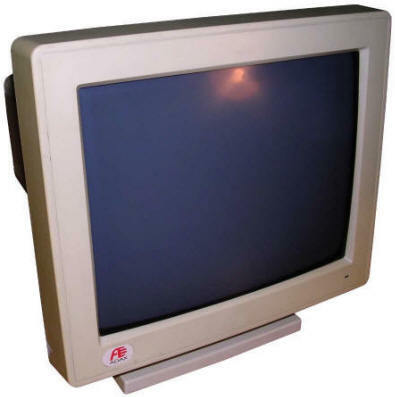 Its 14-inch tube can show picture in 640x480 or 800x600, but displaying 1024x768 in typical scan rates is outside its capabilities - only interlaced mode is supported. 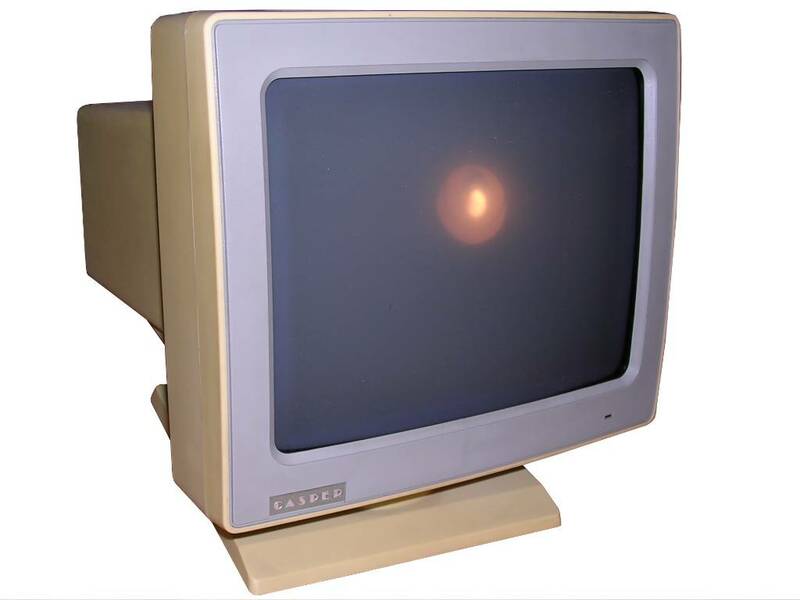 Contrary to many similar CRTs, this one has significant amount of trimmers and knobs to tune picture brightness, contrast, horizontal and vertical sizes and positions. 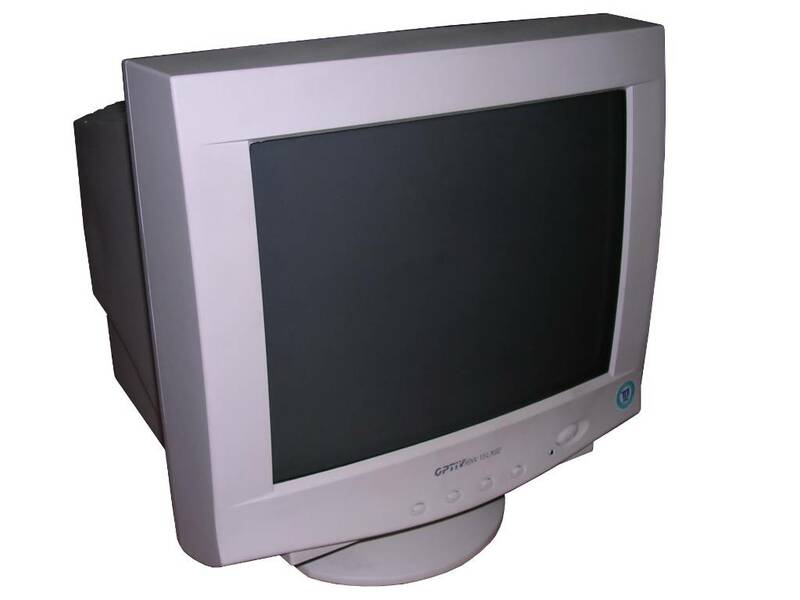 These displays were made by Daewoo and sold under different brands. 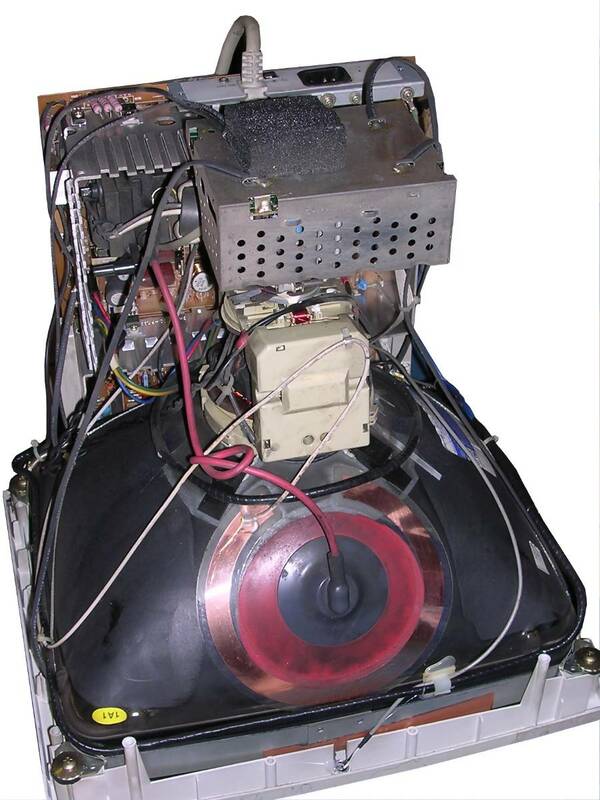 This unit has been bought with 386 computer through German company and was operating since mid-1992 with special shield on it. 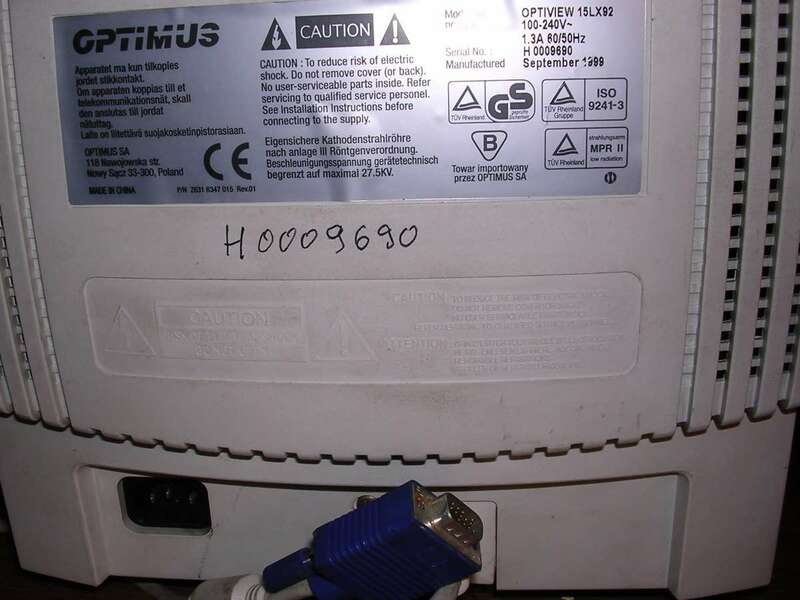 Later it was used with Pentium computer, until it was replaced around 2003. 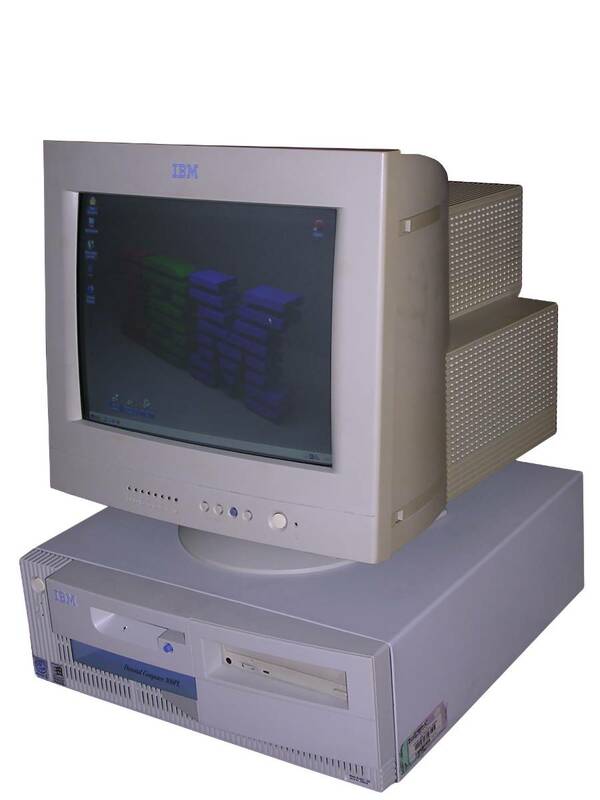 I got it later, around 2005, and since then used in my "service shelf" to test PCs. It works without problems even today . Protective shield... and why it was used? 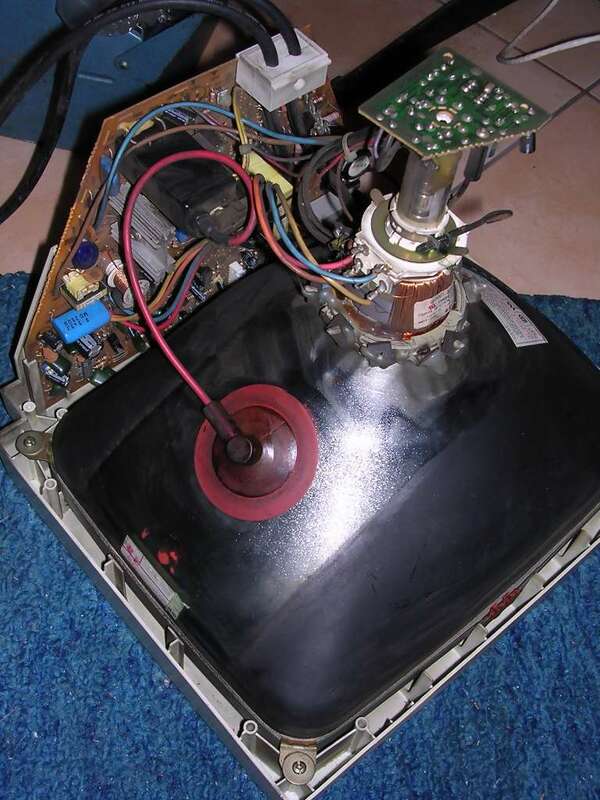 In the pictures below, you can see a "factory new" glass filter for CRT screen. 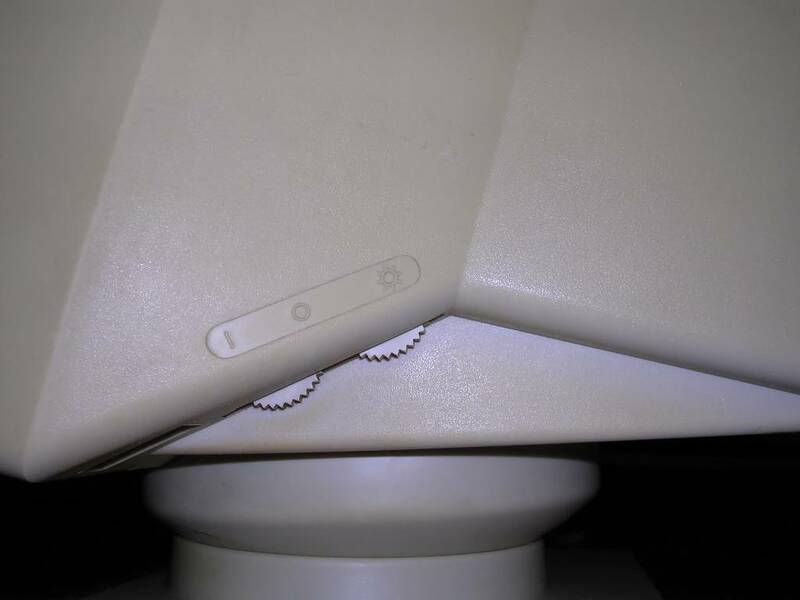 Such shields were used on nearly every new CRT screen in 1990, usually they were glued with stickers, hanged on special belts or mounted on Velcros. Why? There were a few reasons. First, screens are made of glass. Glass reflects light and computer monitor screen reflects light even more because in most of DOS operation its surface remains dark. When user looks on screen, the contents should be shown, not reflections of the background. Cheaper plastic and more expensive glass filters minimized this effect. Second, these filters at least tried to "flatten" the screen making eyes strain less. 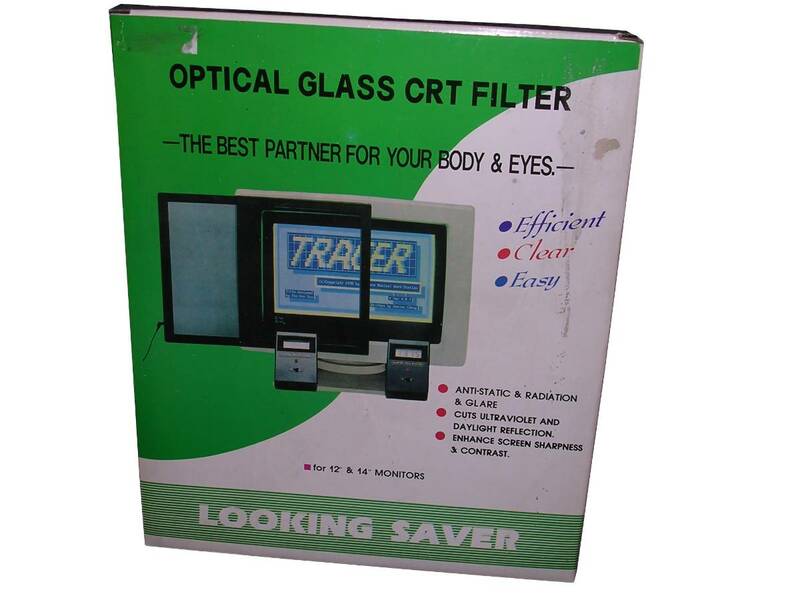 Although picture may be flat, looking at the non-flat surface of CRT may be the factor which makes eyes more tired with time. But the main reason of purchasing shields was the fear of not-so-specified "radiation" coming from screens. 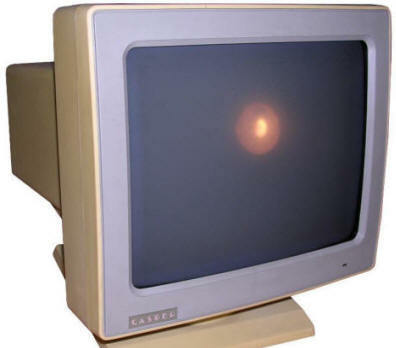 Some people told that it was X-ray, but most of screens got rid of X-ray problems in 1980s. 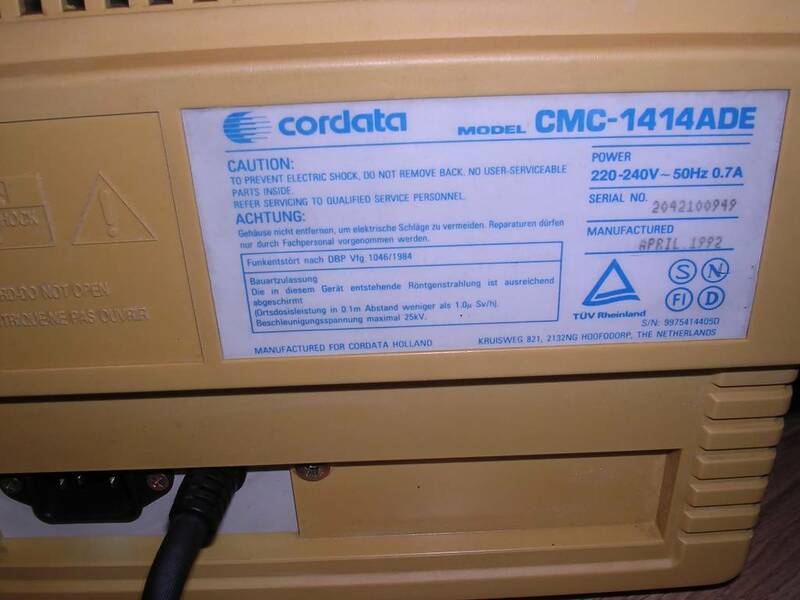 Other spoken about static electricity, and indeed this shield has conductive layer and grounding cable to drain the static electricity to ground. 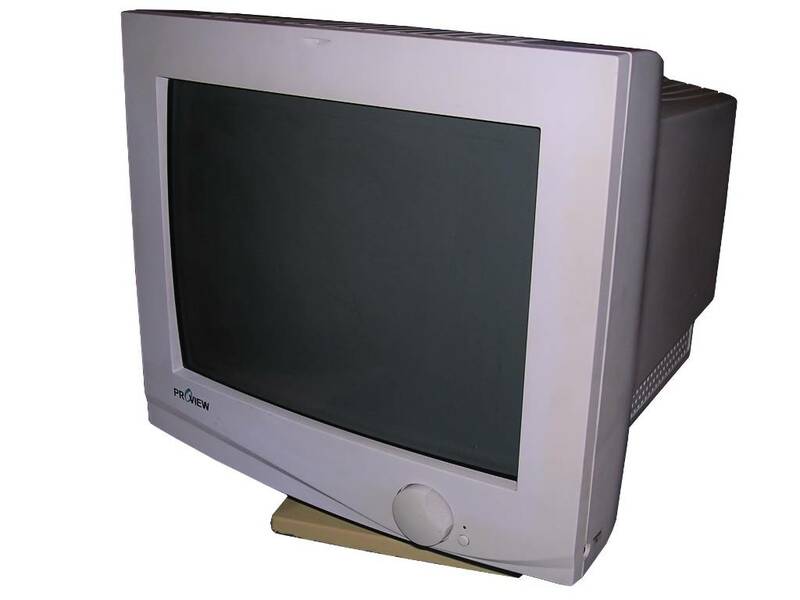 Another component of this urban legend were some unknown "microwaves" which came from the monitor and caused headaches. However, the biggest cause of headaches was always... using interlaced garphics modes :). So people bought these in a futile hope that these shields will make their problems smaller, and they usually made the brightness smaller. 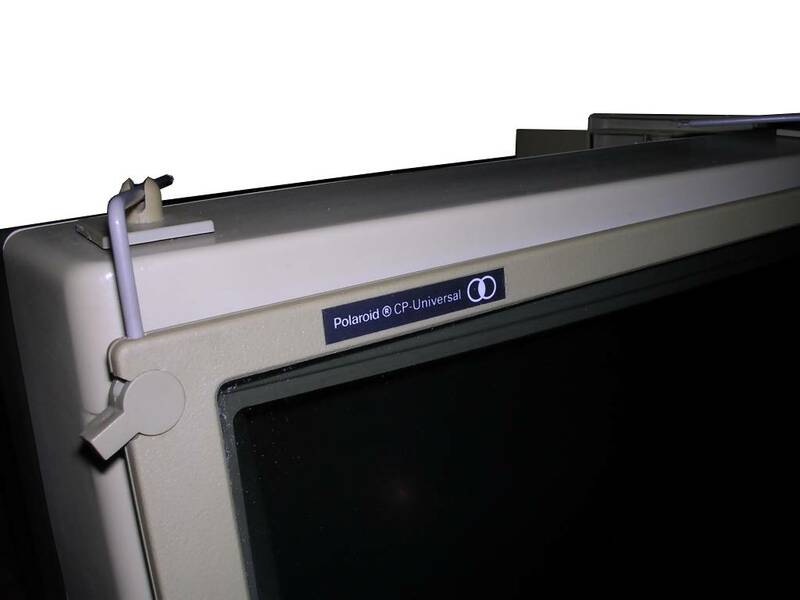 Similar accessories were "anti-ozone" devices for laser printers and (warning: huge urban legend) a pot with polypodium standing on TV or monitor. 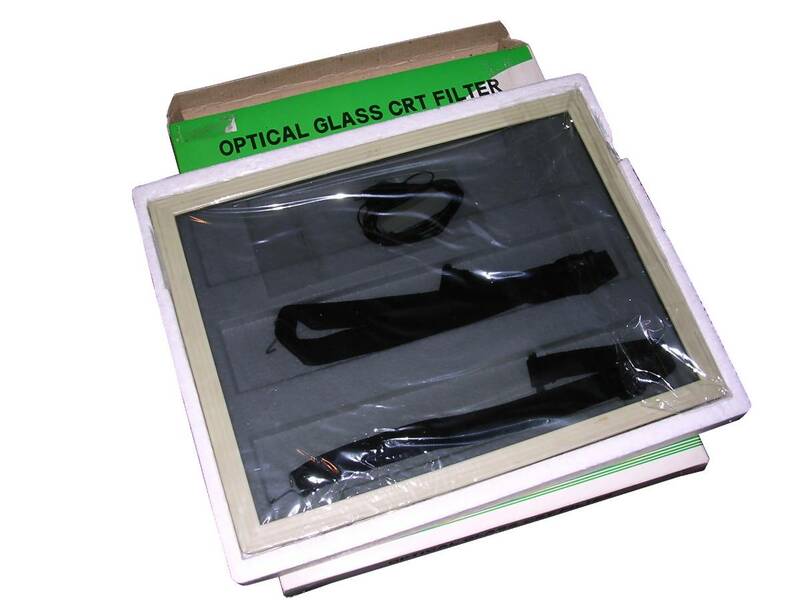 In 1990s there was one more kind of special filter: Filters which made display's view angle smaller. Why make the view angle smaller? 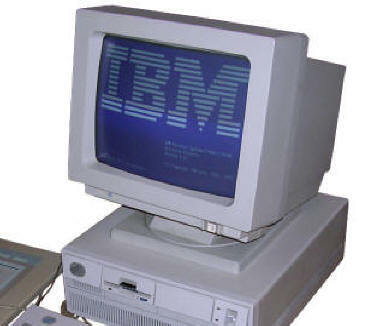 In many offices, a few displays were clogged on the same desk used by many people. 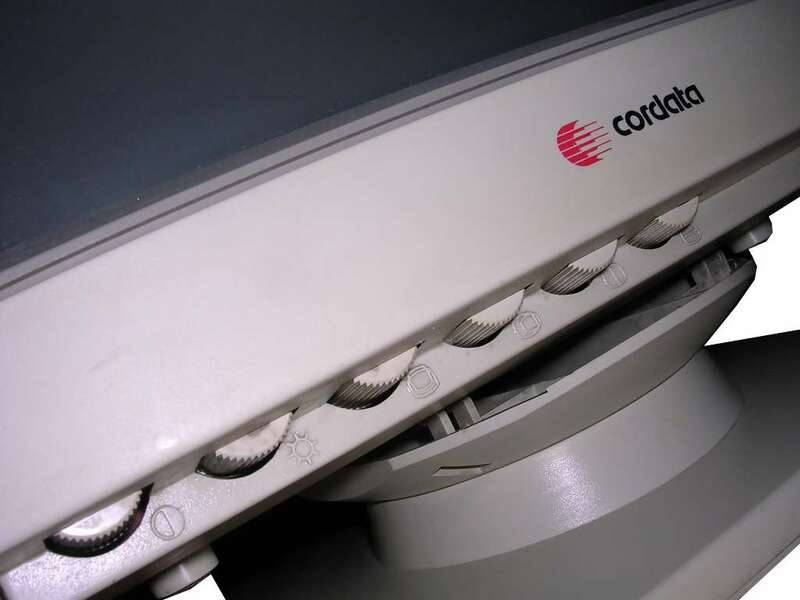 These shields were used to make co-workers not lurk on your screen. 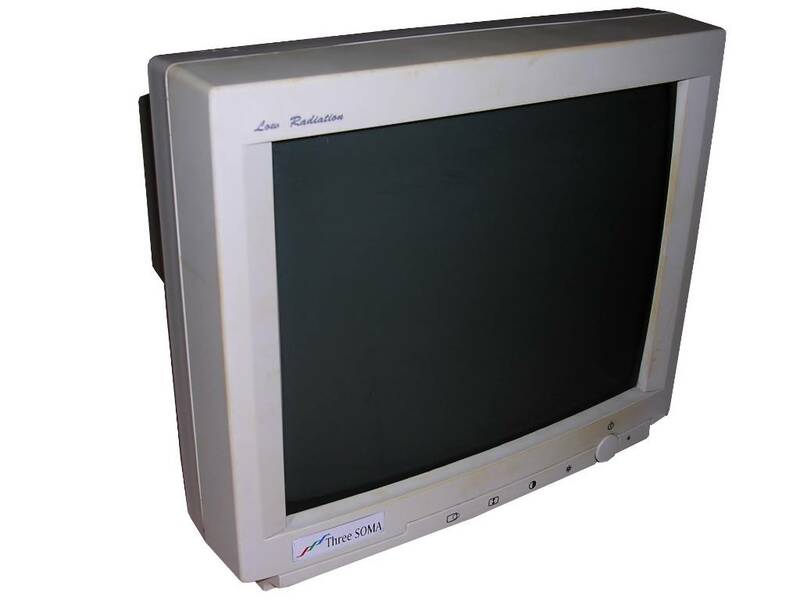 This is a VGA version of EMC EM-1412, which supports 640x480 and 800x600 modes in its 12-inch monochrome white screen. Two modes have separate v-size controls. 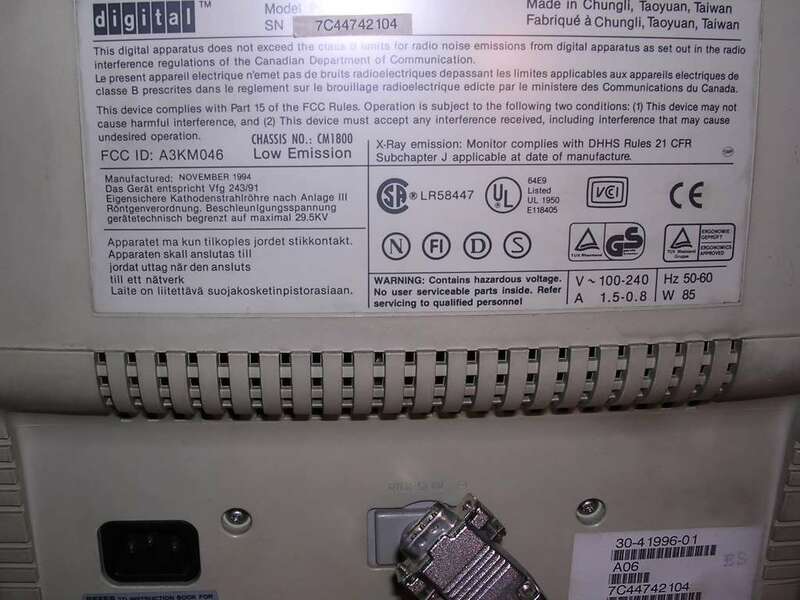 Inside it's another Taiwanese or Korean Hyundai/EMC-like monitor. 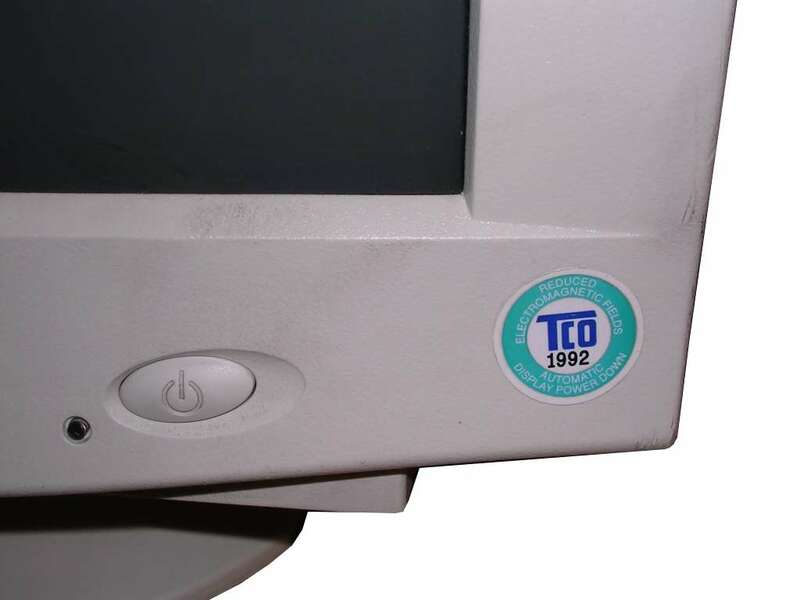 Outside, we can see two stickers which help in identifying monitor's age. 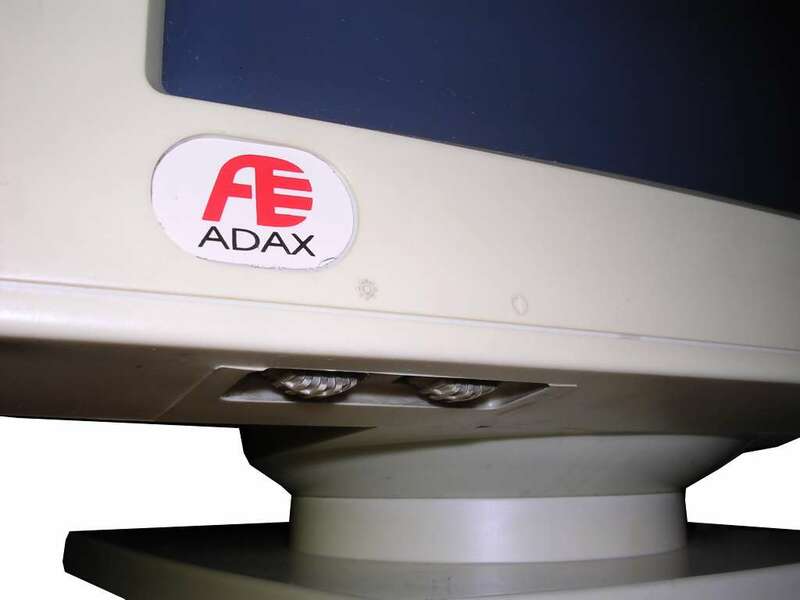 First one is Adax logo used since ca. 1993, so I assume this display is from early 1990s - early 1417s were made even in 1991. 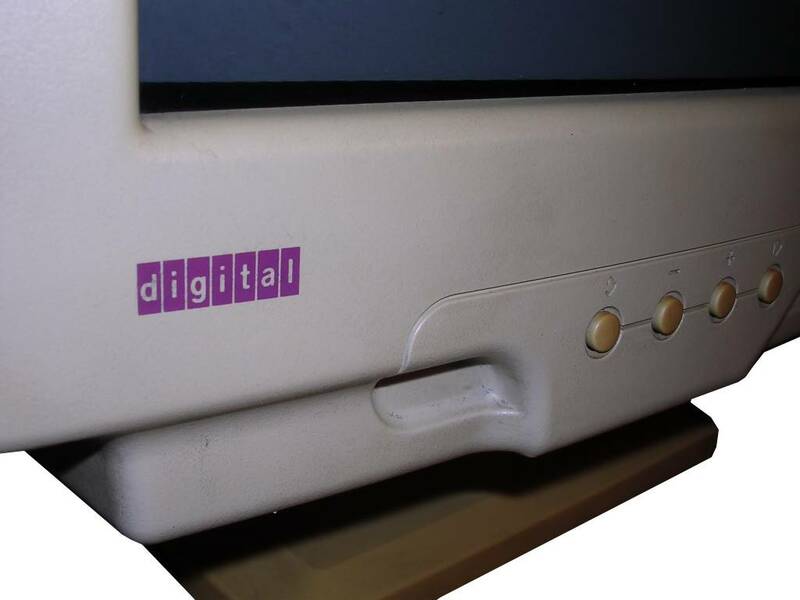 Another sticker is from IZI, a Polish office systems supply company. They were both making their own systems as well as maintaining existing systems in 1990s, while their website is present since around 1999. 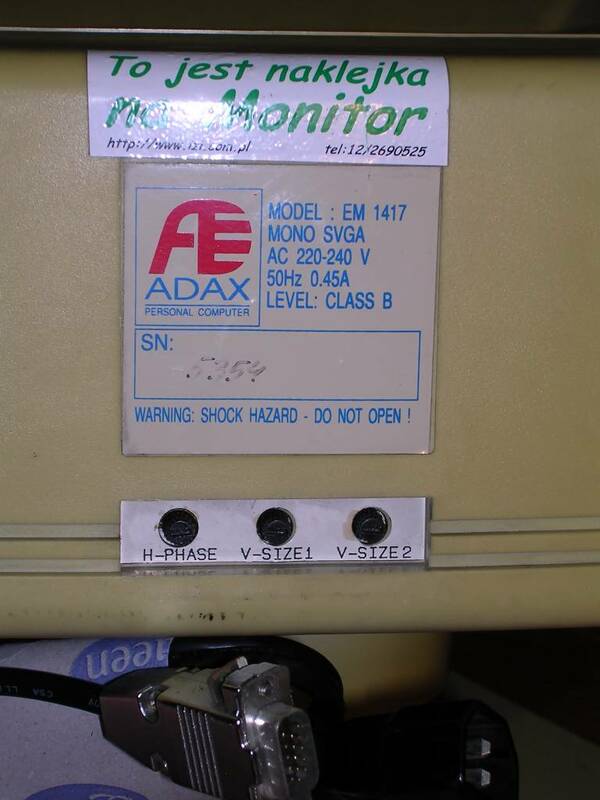 It is quite possible that they converted or upgraded existing Adax systems and that's why this sticker is on this display's rear. 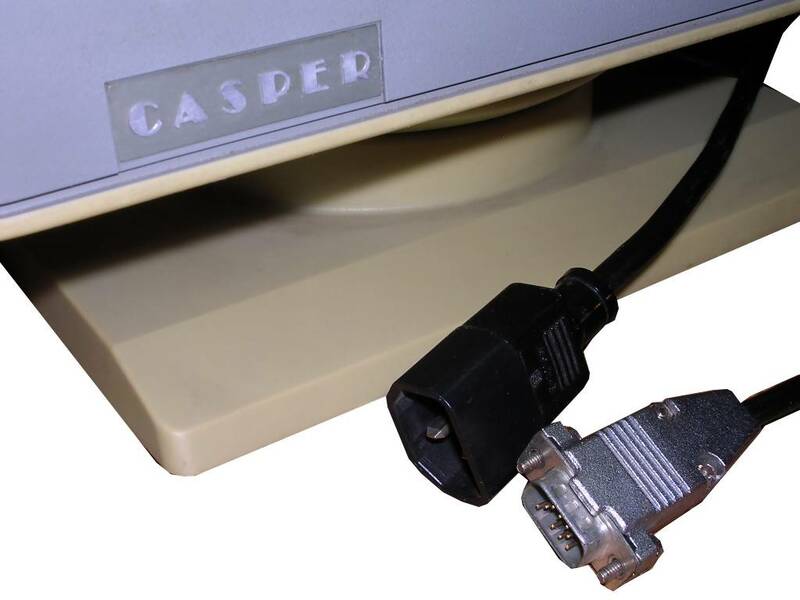 This unit has power cable equipped with power supply plug to be turned on simultaneously with computer. I got this unit in early 2000s when it was "around 10 years old". I found that these displays need quite long time for warm-up and getting a full sharpness after they were stored for a longer time. 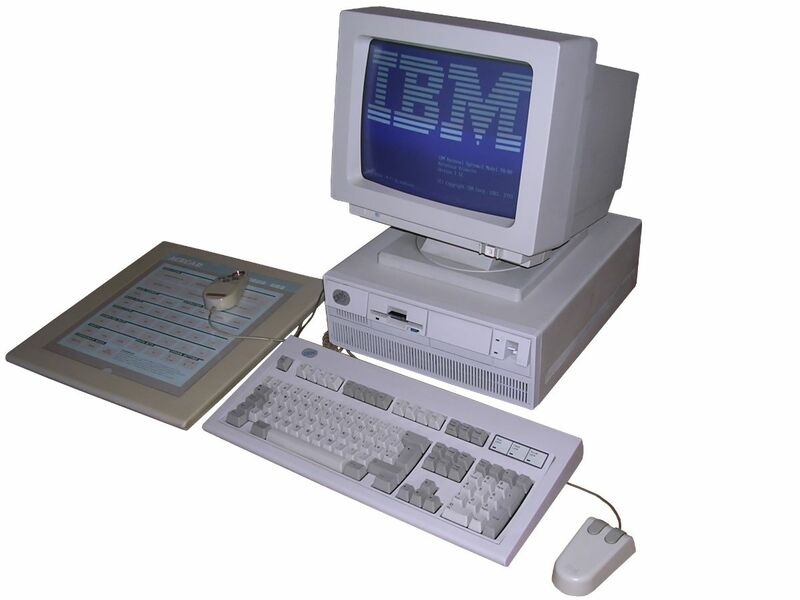 A display used mostly with IBM PS/1 computers, I got it with PS/2 model 70 where its pictures can be seen. 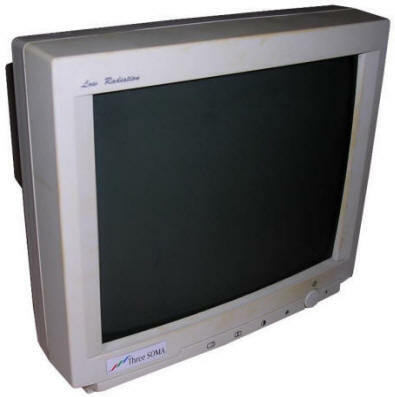 These monochrome displays were manufactured since early 1990s until 2000s in quite unchanged form, for embedded systems and point-of-sale computers. Some of them are used even now in cash register systems - if not strained by large, bright picture they could display for years. Technically it can display 800x600 and in interlacing even 1024x768. 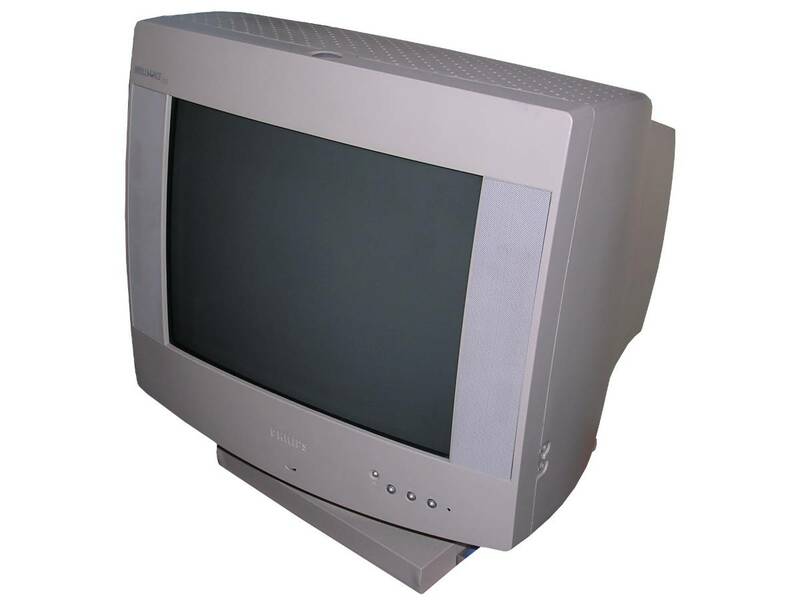 They have been manufactured until late 1990s, when LCD became cheap enough for point of sale systems. I have two units, one is not used, the second is after about 9 years of usage in point-of-sale system in 24/7 for about 6 years. There are burn marks, but thanks to proper servicing (moving picture here and there, resizing) they are not visible as in e.g. 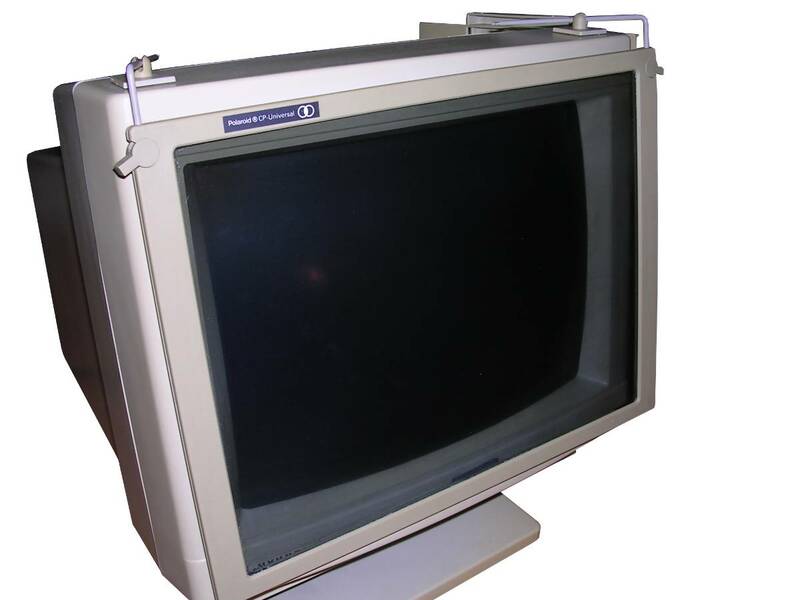 PS/1 display. 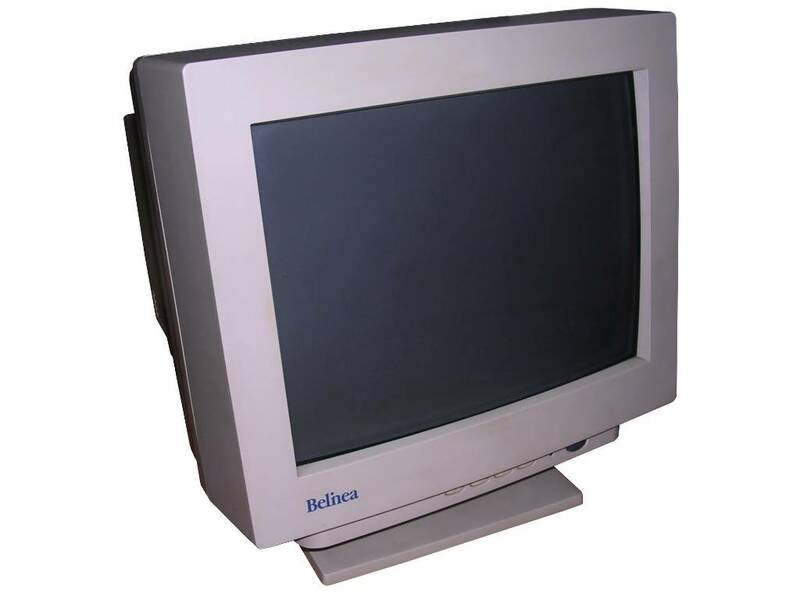 This display is a typical monochrome VGA display, commonly used in point-of-sale systems and some non-requiring PCs. 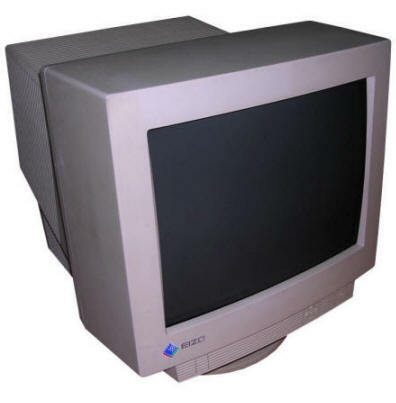 In mid-90s also there was a rumour that office systems should have monochrome CRTs because they don't fatigue eyes so much and prevent using computers in other purposes (read: excessive gaming). 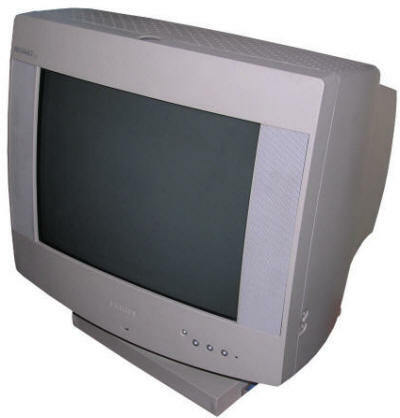 So there still were needs for a monochrome CRTs in mid-90s. This one is small, light and easy to use, comparing to earlier mono units picture is nice and sharp. 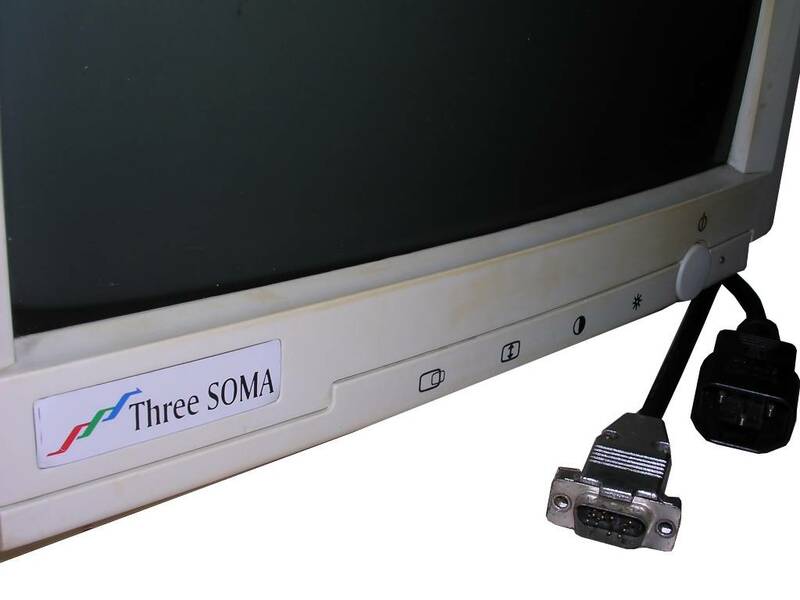 These displays were branded as Optimus and sold with Optimus PCs, and probably this "Three SOMA" logo was some way connected with Optimus. There is even "Optimus" logo on the rear. I'm sure that these units were manufactured in 1996 too. 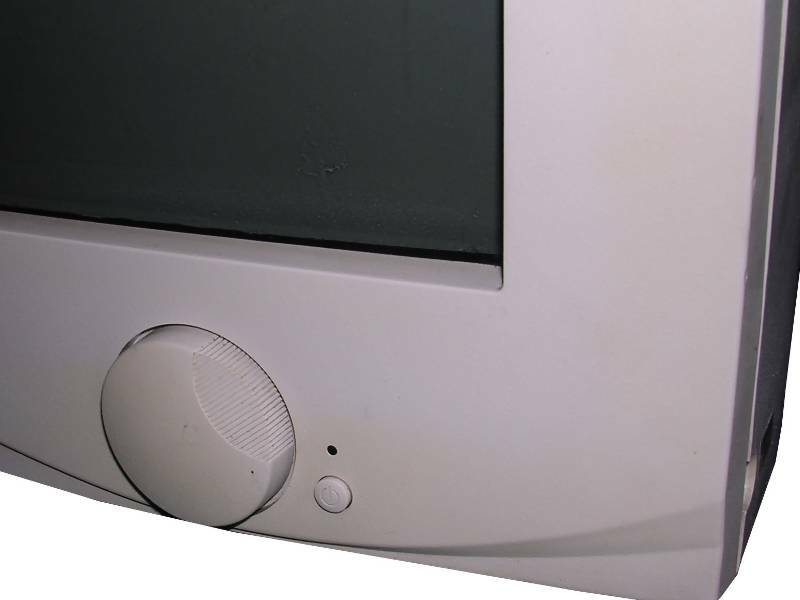 In mid-1990s, newer displays acquired one distinguishable function: OSD, called On-Screen Display menu. This is one of the early displays with OSD for manipulating picture size and position, but brightness and contrast is still set with dials. Maybe it's more comfortable and quicker to change? This is quite early OSD, but still OSD - a text menu shown on screen during setting. Earlier models had a series of LEDs displaying currently chosen setting and +/- buttons to set values. Generally the display has still quite nice picture quality and was used until 2010s! 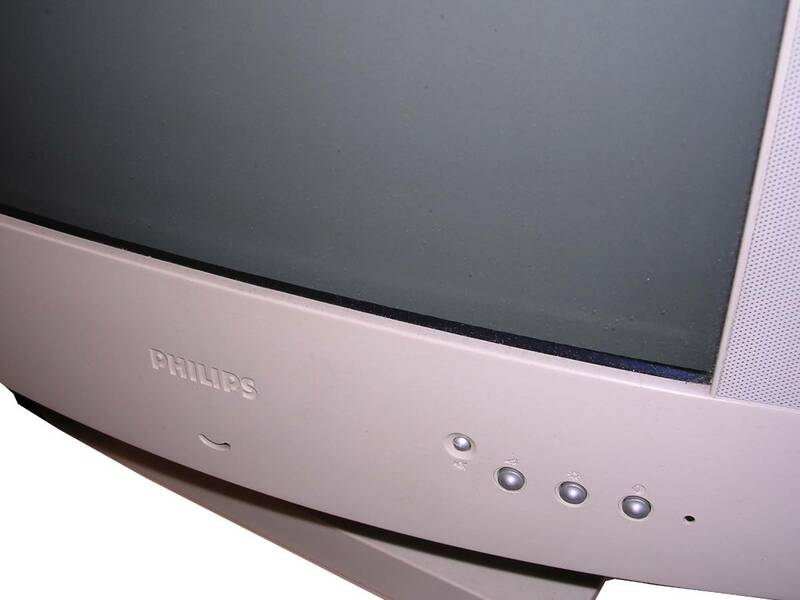 It was retired only to be replaced with 17-inch Philips. What is interesting, it has added a board inside which offered ability to turn the monitor off by software. 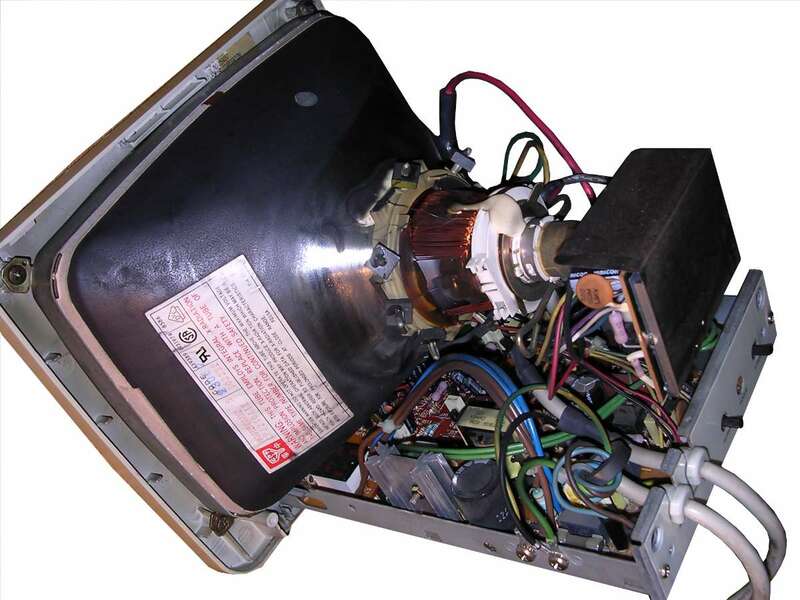 This "soft-off" was an early attempt to introduce energy saving modes to displays. 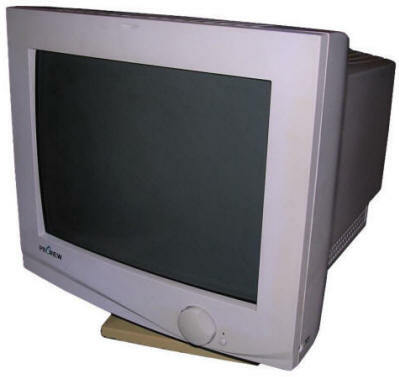 A typical VGA display from second half of 1990s. 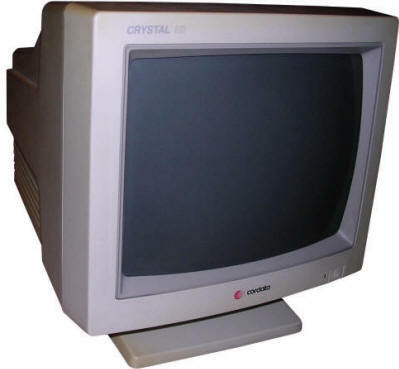 It has a 15-inch CRT and OSD. 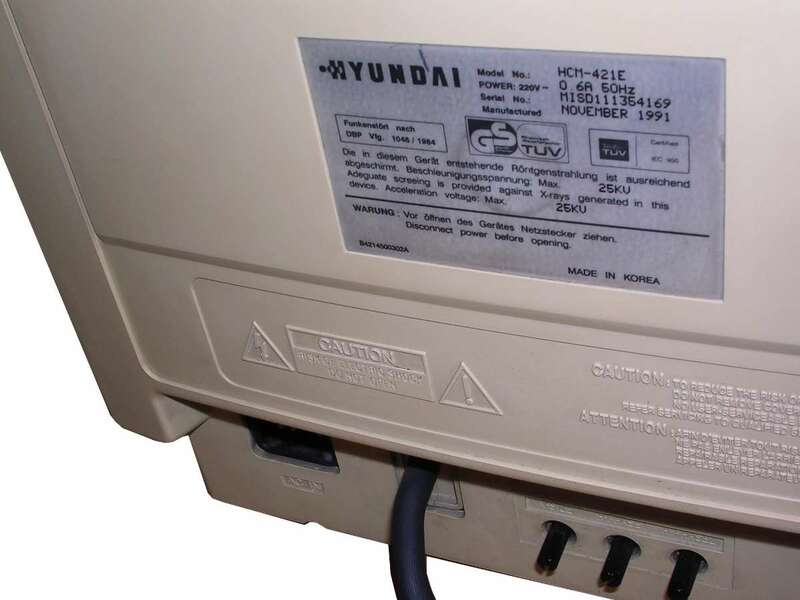 It was manufactured in one or other variant for years, early similar units are from late 1996. 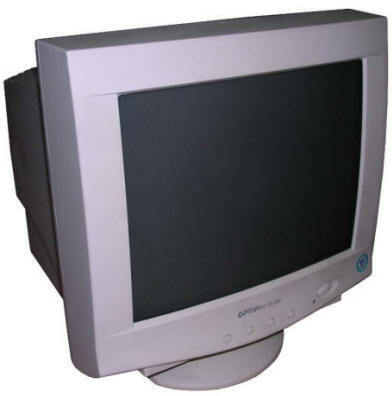 Although it has been introduced as high-end, later it was sold as a typical small monitor for all purposes. 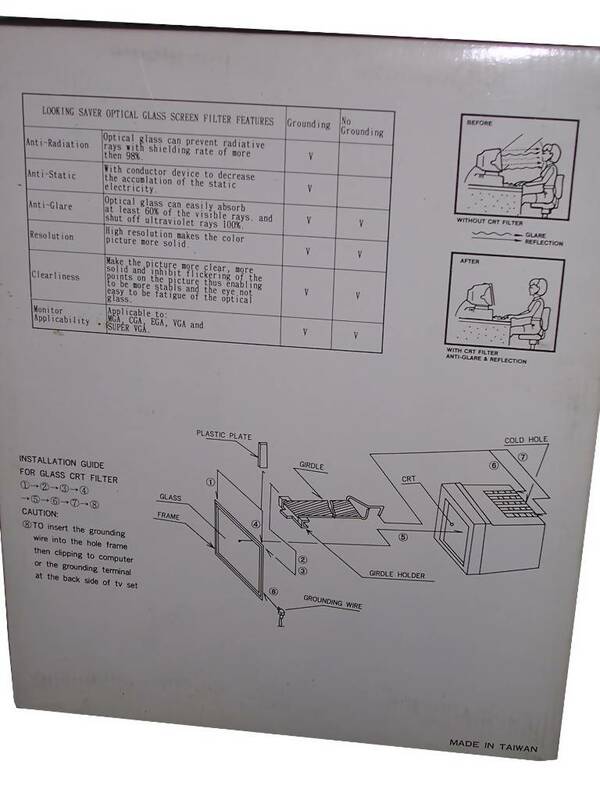 Its picture is not very good, but totally sufficient for office applications. 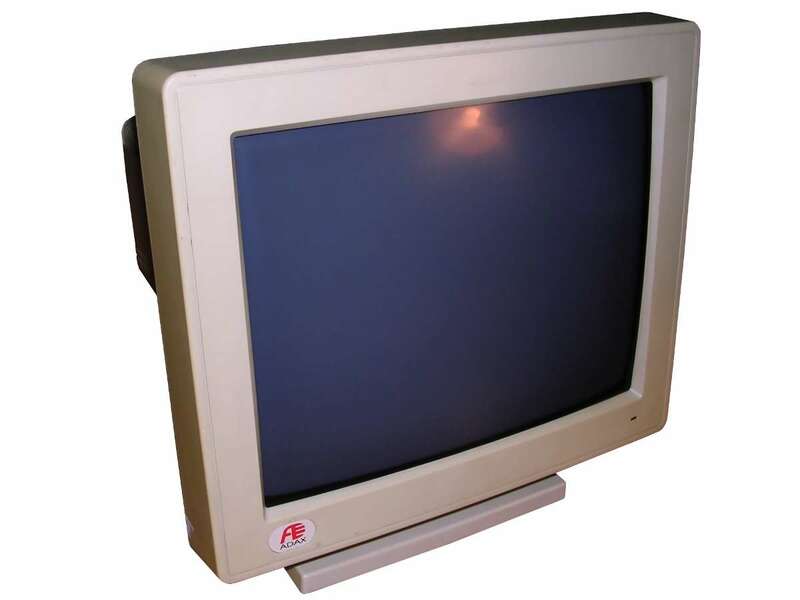 A high-quality display from 1990s, with 15-inch tube, full OSD and custom settings. 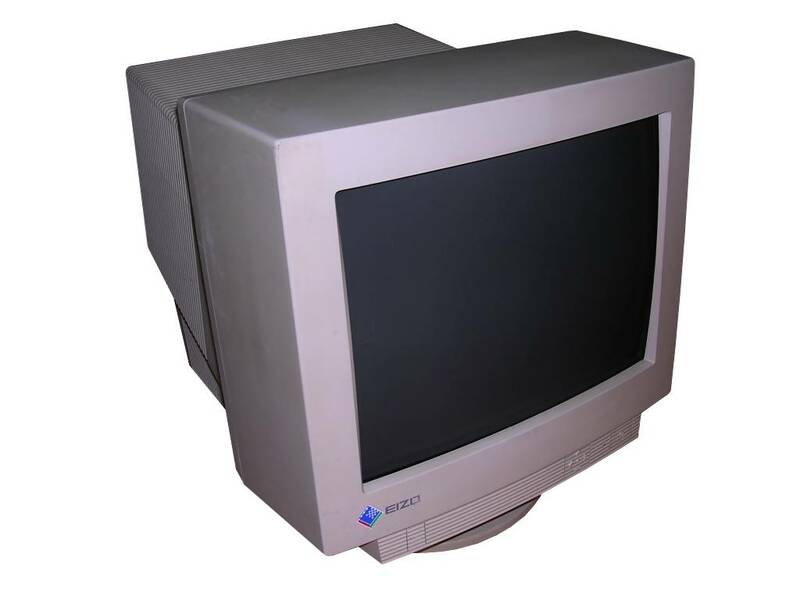 Eizo is a Japanese company known from their monitors, especially CRT-based ones which had much better quality than usually bought Taiwanese displays. 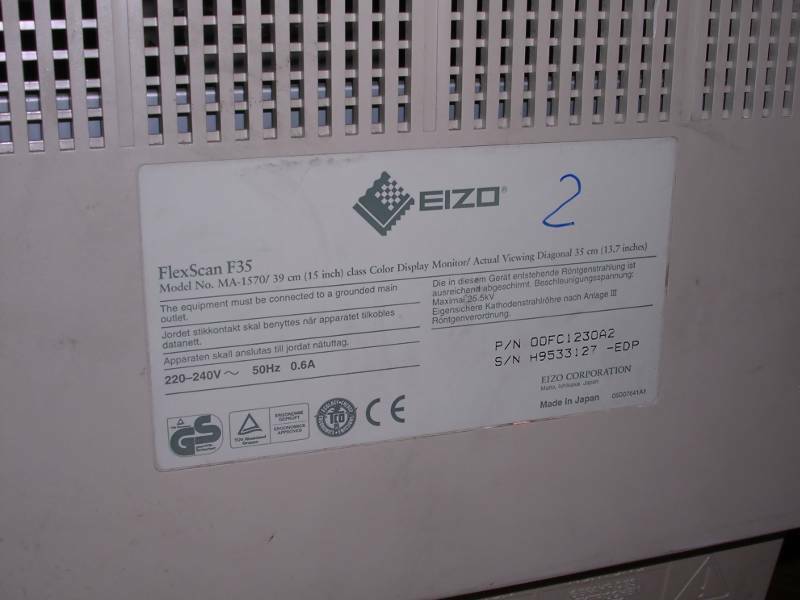 The downsides of Eizo displays was its size - forget about being smaller on the rear, Eizos are in fact higher on the rear because there is lots of electronics inside. Another problem with these displays is the lack of good documentation for service. Comparing to other displays, this one gives much better picture than typical monitors from their time, and even later Philips models. Its OSD, as in most Eizos, is driven with 4-way "joystick-like" switch set. 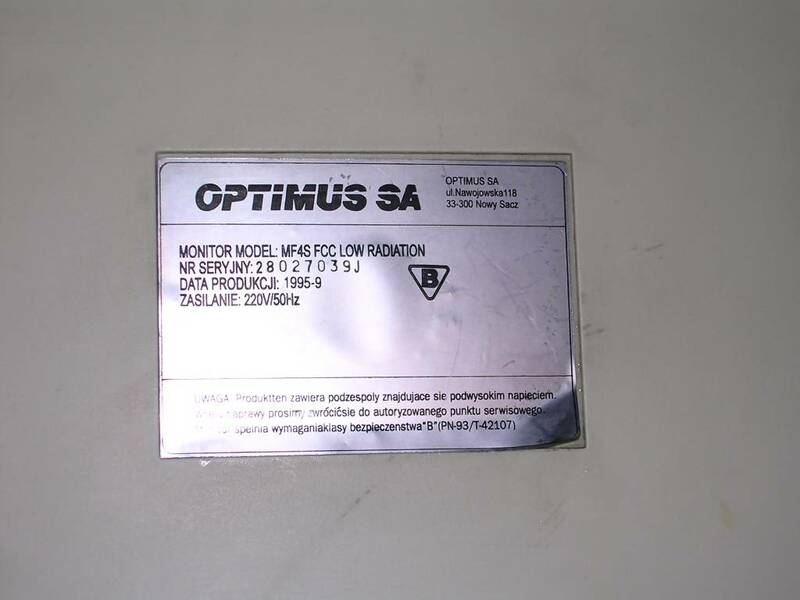 This display is a Chinese or Korean display branded as Optimus, a Polish company which was, according to legend, "building computers" (in fact importing parts). The display works relatively well, has a modern OSD menu and its casing looks large and solid. 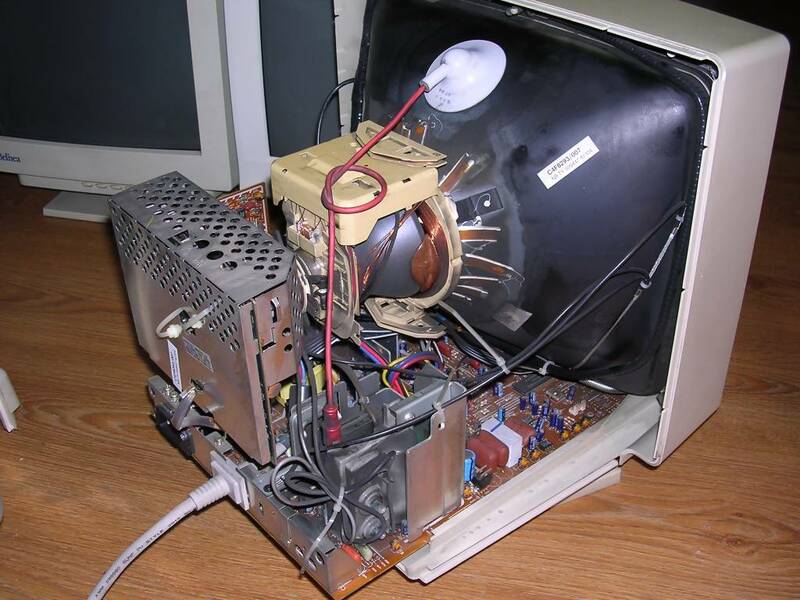 The only problem with all of them was their internals - they overheated. Having 15 of them in a computer science lab was sufficient to keep it warm. 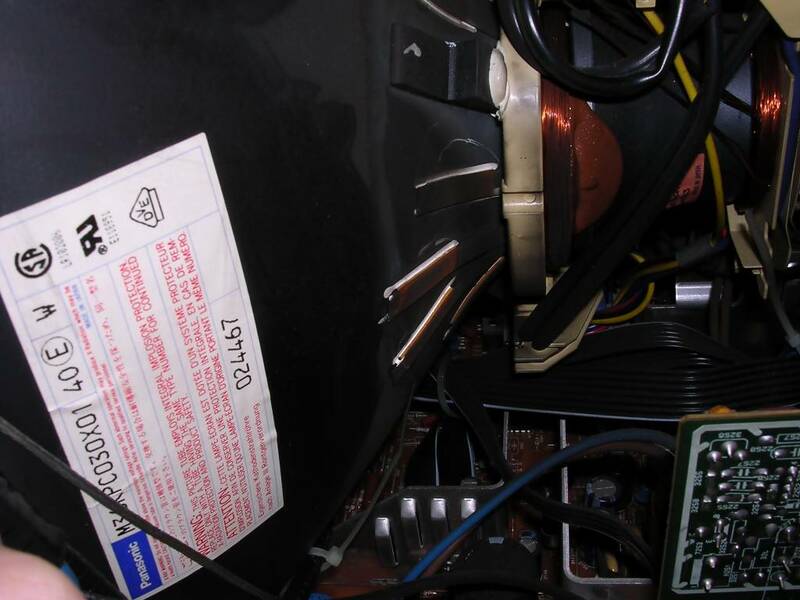 And not the high-voltage part overheated, but the digital circuits. 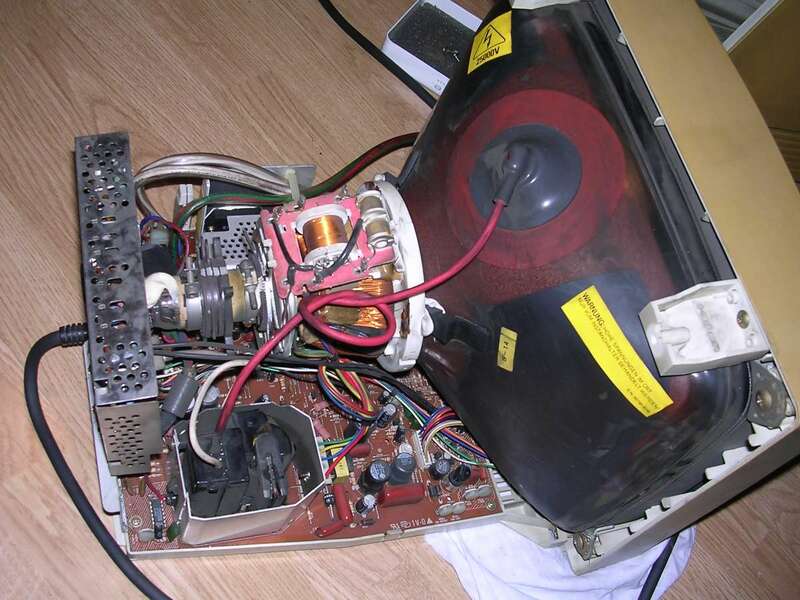 I still have no idea why, but some users recommended even sticking a small heatsink to microcontroller if its overheating caused the monitor to reset. 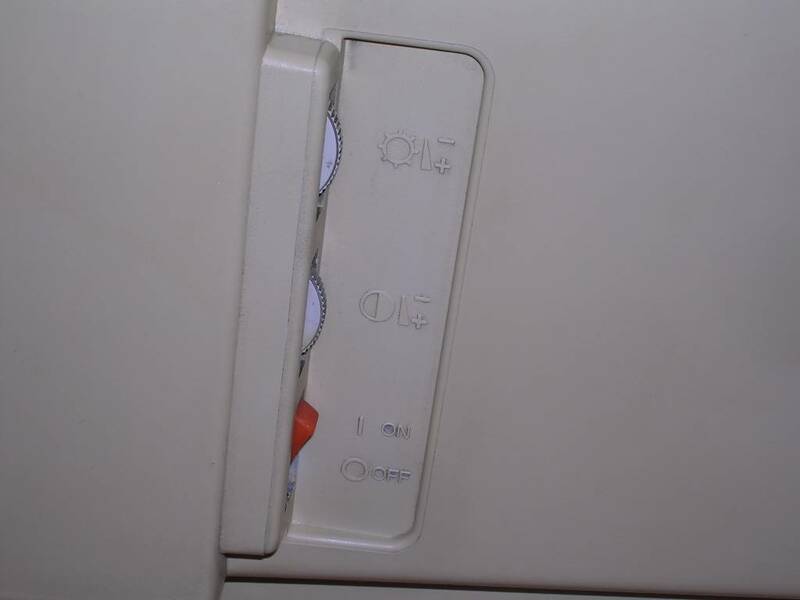 The problem with heating has been solved years later, in next models which just used different electronics. The official explanation of 15LX overheating was that, when it failed, it was user's fault. But they rarely failed on warranty period. This is an "all-in-one" monitor, having not only a nice-quality display but also a built-in speakers and microphone. 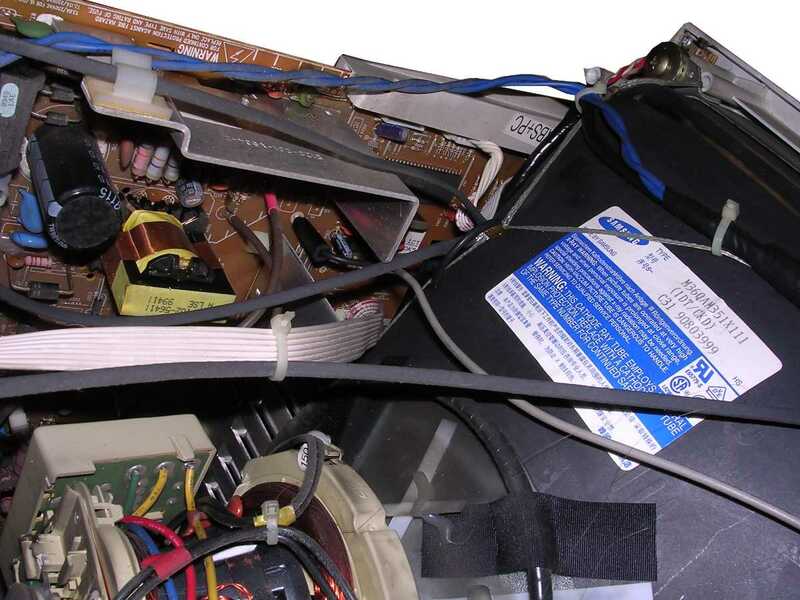 Thanks to using elongated sound pipes, speakers don't interfere with CRT. Its 15-inch tube gives a nice and comfortable picture, and according to specs it is theoretically possible to get 1280x1024 on it. Its appearance is not so slim and compact as in other displays, this one has a wide casing with speakers on sides of the screen and its rear doesn't get as narrow as in other displays. Unfortunately Philips got too far in one aspect: Configuration. The dials in front of display are only for volume, brightness and contrast. If it's needed to set picture size, position, correct shape or colours, all is done using Philips software which communicates with display by... flashing bitmaps! Seriously, while changing settings it looks like a series of specific colour bits are shown on screen. This way uncertain display-detection pins are not used and additional cables are not needed, but the software works only in Windows 9x (probably partially in XP). I got my unit with disappearing colours problem, and built-in signal cable had to be replaced. 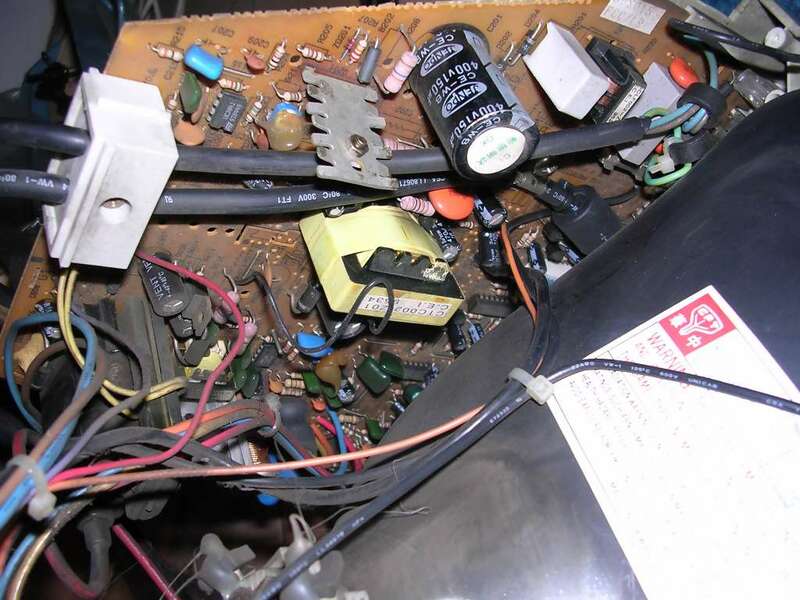 Few years later capacitors near HV circuits caused slight distortion, which was fixed. It is still used. Configuration software - works in Windows 9x. 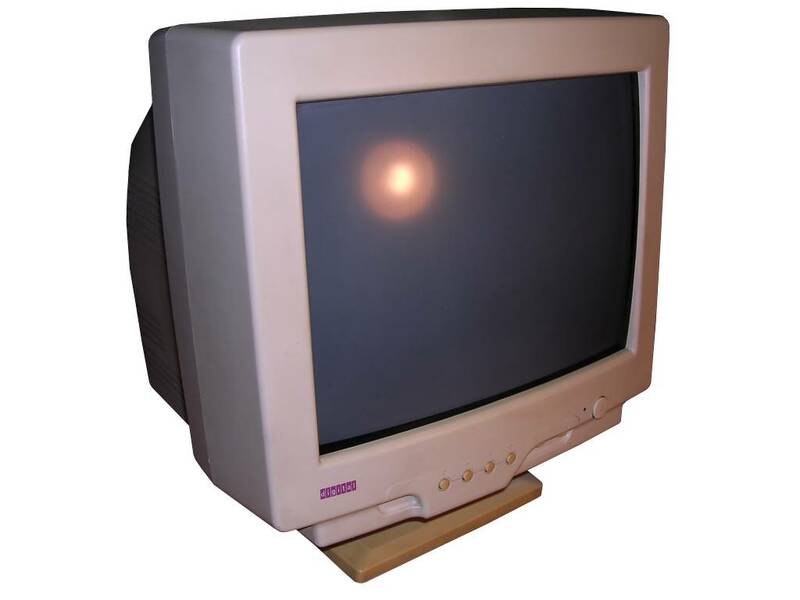 In late 1990s display manufacturers started to add more devices to the monitor to make them multi-functional. Although it ended with USB hubs, some displays had speaker sets and microphones. 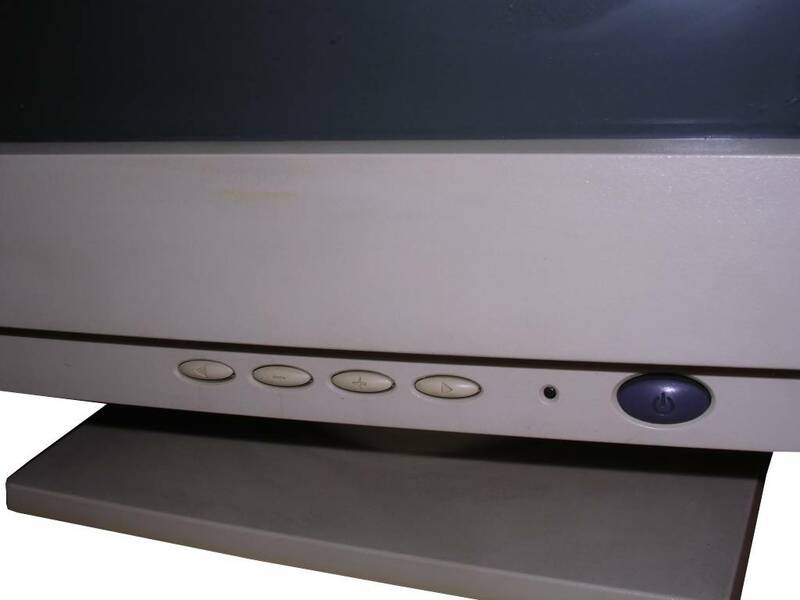 But it's not easy to fit good-quality speakers into the monitor casing because speakers are highly magnetic and CRT reacts to magnetic field. Although e.g. 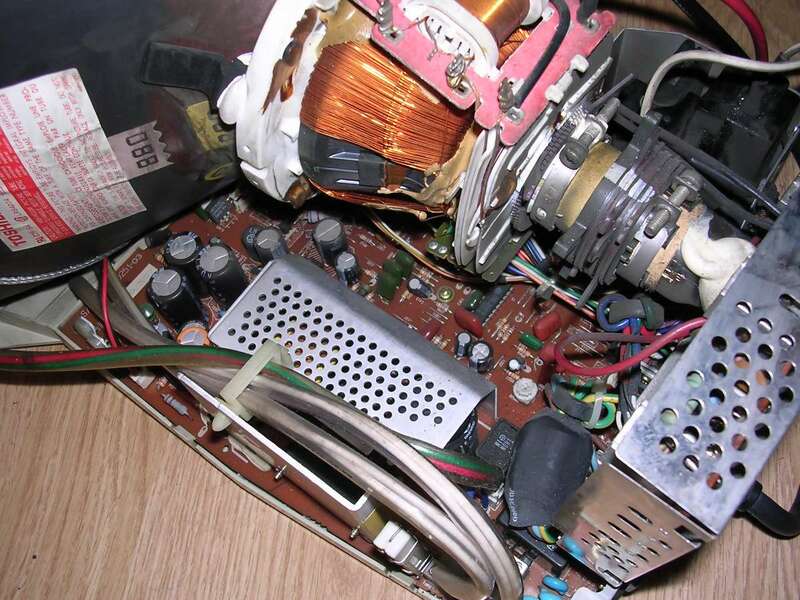 Philips found a way to install speakers inside by using sound tubes, manufacturer of this display decided to go another way: They included a mic inside display, but speakers were totally separated, only power supply was present. The picture quality is as typical as for most Taiwanese/Chinese/Korean displays from its time, however in maximum 1280x1024 resolution the quality is significantly lower than in other 15-inch displays. 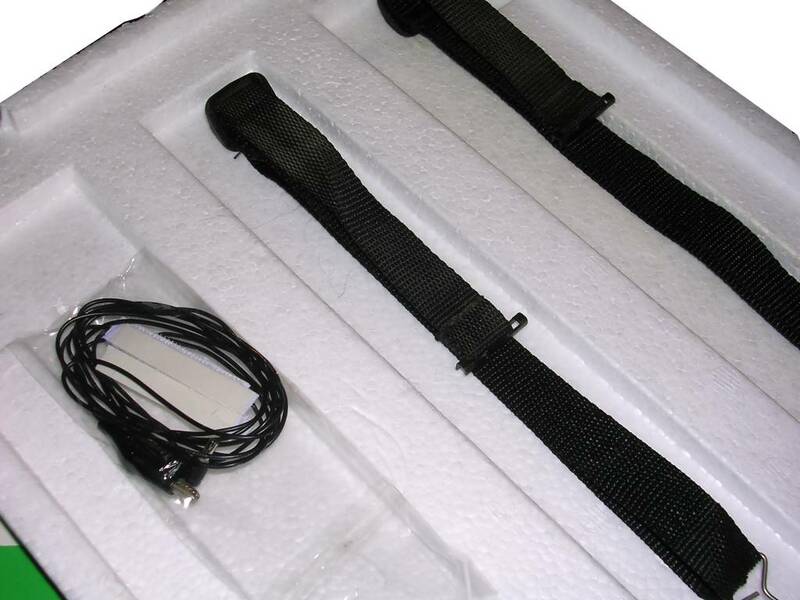 An attractive part of this display is controls driven with rotary encoder instead of buttons. This idea was duplicated in some other displays from its age. 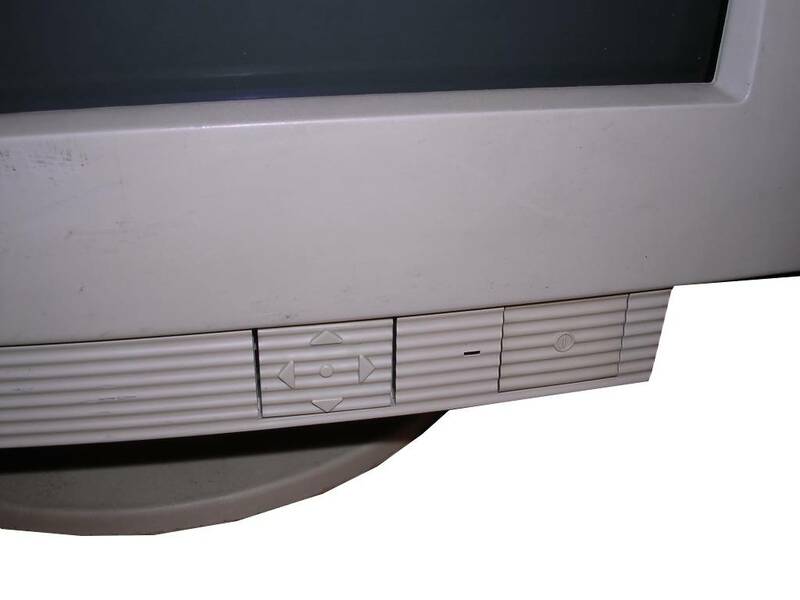 An OEM for IBM PC-300PL computer. Generally: Picture quality: Worse than the worst LG. Overheating: High, possibility of fire. Change to repair: Knowing which part they screwed up "is forbidden" (official IBM state). Avoid it.